Newport Harbor High School, CA – The Lott IMPACT Trophy launched their new charitable initiative- The HITS (Helmet. Impact. Technique. Safety) Program which takes a smarter approach to Football. 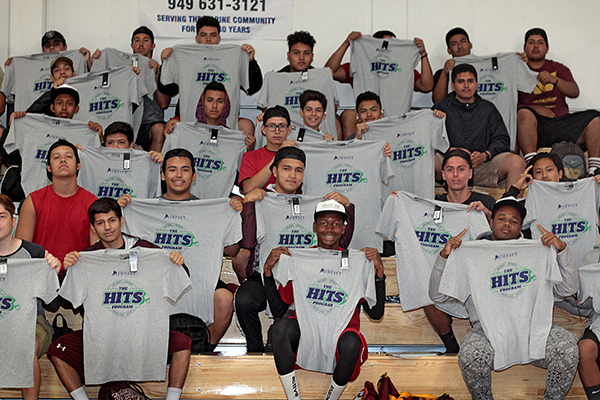 Over 200 youth and high school football coaches, players and parents attended the event at Newport Harbor High School, where they were taught the importance of proper equipment fitting and tackling techniques to achieve a safer game at all levels. Following a welcome video from the Lott IMPACT Foundation, USC Football’s Equipment Manager, Todd Hewitt, gave instruction on proper equipment fitting techniques. Hewitt was followed by Dr. Vernon Williams and Dr. Ilan Danan of Kerlan-Jobe, a leading orthopedic and sports medicine clinic in southern California, who discussed how new techniques can lessen the physiological impact and reduce injuries associated with playing football. USA Football gave a 30 minute demonstration on the proper tackling technique, followed by a review of legal tackles led by NFL official, Laird Hayes, and current Los Angeles Charger, Joshua Perry. The HITS clinic wrapped up with a Q&A session led by legendary coaches Terry Donahue (former UCLA Head coach and College Football Hall of Famer), John Robinson (Former USC and LA Rams Head Coach and College Football Hall of Famer), Mike White (Former Cal, Illinois, and Raiders Head Coach), and Joshua Perry (current NFL player with the LA Chargers). In addition to information from Kerlan-Jobe and USA football, attendees were given the Seattle Seahawks Tackling DVD focusing on how Seahawks players are taught to tackle and approach the game to minimize injuries. HELMET – Fitting your helmet and equipment properly is the first step toward improved safety and a better playing experience for everyone. IMPACT – Limiting the amount of time on full contact and high impact drills has proven to reduce injuries and concussion rates. This is the first step toward providing parents with more confidence in letting youth participate. TECHNIQUE – Learning the proper technique is the key to good tackling but also reduces the blows to the head. Our HITS clinics demonstrate proper tackling taught by coaches, players and referees who know the game. SAFETY – Data is power and getting the proper information leads to confident decisions. Combining these three elements leads to a safer game and continues to better educate parents that safe football is a possibility. Improved safety will increase participation rates and ensure confidence in this great game we love.